From the Disney Dream's Royal Palace, one of the main dining rooms serving Continental and French cuisine. 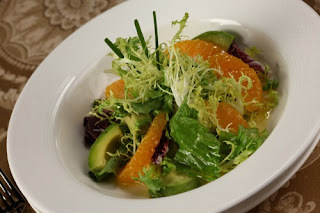 This salad is not only delicious and refreshing but very healthy. Containing avocados, one of the top 10 superfoods for it's health benefits of monounsaturated fats to increase "good" cholesterol. After exercising this is a perfect meal to refuel with and is tasty. lowly drizzle in oil, salt and pepper, whisking vigorously until combined. If making in advance, re-whisk before serving. Cut peel, including the white pith, from the oranges with a small knife. Cut segments free from membranes; set segments aside and discard membranes. Cut avocados into 3/4-inch-thick slices. Divide mixed greens among 4 salad bowls. Top with 5 avocado slices and 5 to 8 orange segments; drizzle lightly with dressing. Serve immediately.